We love scavenger hunts – really love scavenger hunts. They’re fun, engaging, get you moving, and are a great way to sneak in some extra learning. 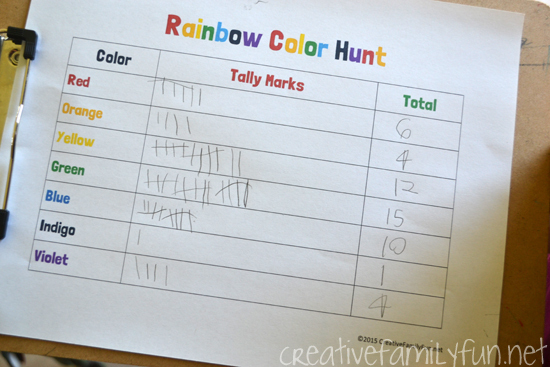 We recently spent a hot summer day on a rainbow color tally mark scavenger hunt throughout the house. It was a great way to sneak in some math practice. We were looking for the colors of the rainbow and also practicing tally marks at the same time. This scavenger hunt can work both indoors and out, but we did discover that there are many more color choices inside. You would definitely want to find a more colorful location (like a flower garden) if you plan on trying this scavenger hunt outside. The hunt is so easy and so much fun. 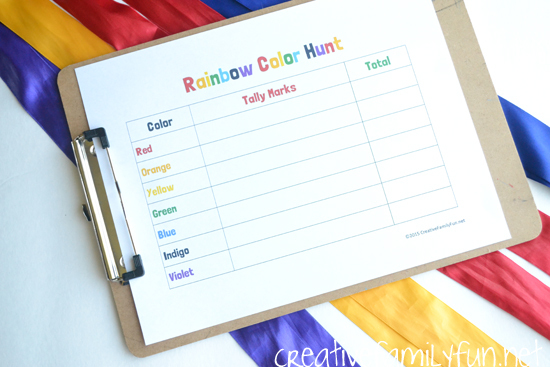 All you need is the Rainbow Color Hunt printable, a hard surface to write on, and a pencil. Have your child hunt for all the colors of the rainbow. Each time that find a color, they need to make a tally mark on the sheet. At the end of the hunt, total up all the tally marks to find out which color occurred most frequently. To make sure there was an end point to this scavenger hunt, I set a timer for 15 minutes. Our goal was to find out how much color we could find in that time frame. My girls worked together to find the colors and total up the tally marks. You could also give each child their own copy of the printable and let them compete against each other to see who found the most incidences of each color. Are you ready to play? 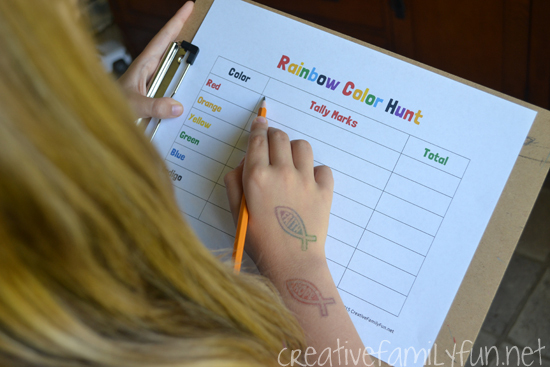 You can download and print the Rainbow Color Tally Mark Scavenger Hunt at the link below. Make simple egg carton rainbows. You probably have all the supplies you need at home. Read a book about color! You’ll find great recommendations for books about all the colors of the rainbow. Learn with Rainbow Writing. Practice spelling words or sight words with this fun activity. Try some rainbow science. Visit Buggy & Buddy for a fun list of rainbow science activities. Planning time: About 5 minutes. 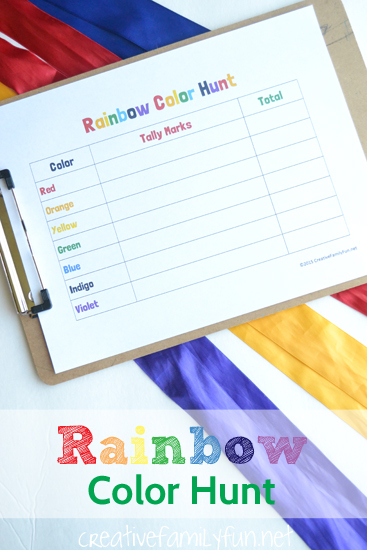 You need time to download and print the Rainbow Color Hunt sheet. Ages: 5 and up. This works best with kids who have already learned about tally marks. You can pair up younger kids with an older sibling or adult if they can’t do tally marks on their own. Time needed: 15 to 30 minutes. Choose your location wisely! You don’t want everyone to get frustrated because they can’t find the different colors.